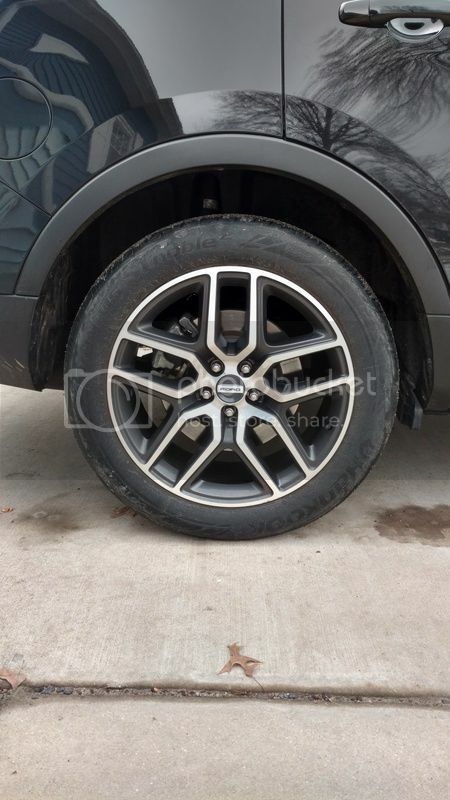 Different options for center caps on 2016 sport wheels? Discussion in 'Modified 2011- 2019 Explorers - Tuning & Mods' started by Blues Fan 30, January 9, 2019. 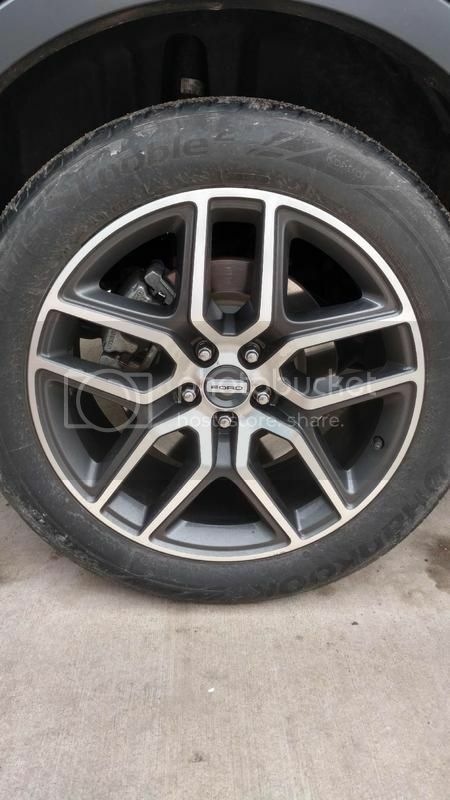 Does anyone know of any options for different center caps on the 2016 sport wheels? I have a black sport and recently swapped the blue badges on front and rear for black and now want to get rid of the blue on the wheels as well but cant seem to find anything. I did a search on here as well but came up empty. A little confused here. You said you already swapped out the center caps, are you looking for more center cap options? I don't recall seeing and wheels with blue on them other than the 'Blue Oval' caps. If you have blue on the wheels themselves, a center cap isn't going to cover that. A picture of the wheel might be helpful. So I found a stock image of what I am referring to. 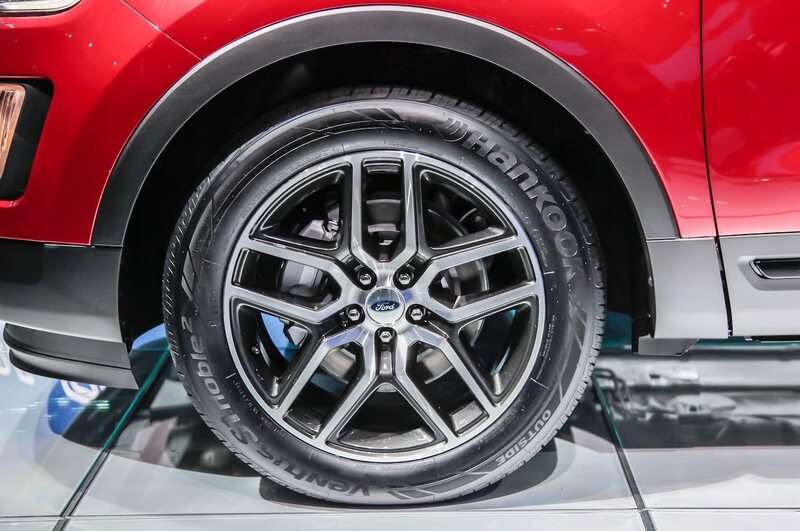 The center cap on the wheels has the blue ford logo and I would prefer black to match the badges I recently installed on the grill and rear of vehicle. Most everything is now black on our ride, and the blue just sticks out to me and doesnt really belong. Interested on if anyone has found something different to get rid of the blue oval on the wheels. I did some research and its a 2.5" diameter cap which is exactly what the ExSport has (I went out and measured). They might look good on the sport wheels. Those look similar to the ones in the thread I posted for $5.22. They are not listed for an Explorer. I saw another post that mentioned 65mm as the possible size. I ended up pulling the trigger on the raptor center caps since the whole set was $15. All the other sets were like $40-60. Figure if it doesn't work I'm only out a few bucks but if it does I feel I'll be happy with the swap. I'll be sure to post up either way with the outcome. 65 mm would only be slightly larger than 2.5 inch so could possibly sand down a tiny bit to fit. Just a heads up (and sorry the ride is so dirty but weather in the STL area has been horrible) but the raptor center caps do fit nicely in the sport wheels. I pulled a center cap and compared before trying and diameter is an exact match. The locking stems if you will appear to have a different gapping, but I went for it anyhow and popped the new caps in and to my surprise they are nice and tight.